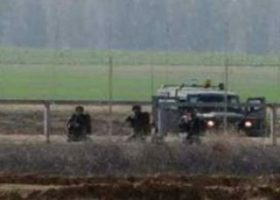 A number of armored Israeli military vehicles invaded, on Monday morning, Palestinian agricultural lands, near Khan Younis city, in the southern part of the Gaza Strip. Local sources said the army vehicles, stationed in the Sofa military base across the border fence, advanced more than fifty meters into the Palestinian lands, while Israeli planes flew overhead. Army bulldozers then started uprooting lands, close to the border fence, under heavy deployment and aerial surveillance. In related news, several military vehicles invaded Palestinian lands in Beit Hanoun, in the northern part of the Gaza Strip, while surveillance drones flew overhead.